How much does a shack on the beach cost? I’m always looking at real estate – there’s something about a home for sale sign that just tingles my nerve endings. Why are the selling, is the furniture nice, what does the other side of the house look like? How long has it been on the market? Are there more houses for sale this year or last year? In Maine – on the beach – most signs are ‘for sale’ – they are ‘for rent’. People buy homes, use them for 2 or 3 or 4 weeks – then rent them out. Or – people buy multiple properties and run the rentals like a business. Or – there are companies that list rentals – and do all the work – you just collect what they send you at the end of the summer. We are staying in the middle category. Frank Sr. was the original owner, Frank Jr. and his sister now ‘run’ the business – we rented just one of his several homes – a 4 bedroom tiny shack across the street from the entrance to one of my favorite sections of Wells Beach. There’s a life guard stand that is manned (well this year – womanned) most days – and at high tide – there’s so little beach left that most people use that time as ‘break’. But there are trade-offs. Yes the house has less than 1000 square feet – yes the bedrooms are so small that they have no closets (which I think means they can’t be called bedrooms), and yes there is just one tiny bathroom. But – there’s a washer and dryer – a full kitchen – both a front and a back porch (you need both to track the sun) – and as mentioned earlier – we’re right across from the entrance to the beach. Easy to nip back for bathroom and lunch breaks. For this glamor – we pay $1400 a week. By Maine Beach standards – it’s about average – maybe low average since the house is so tiny. We could get a smaller place for less – and a larger place for more – but this one suits our needs, and our holiday schedule. That said – I toured someone else’s digs – and now I’m seriously jealous. I’ve been in other places of course – but never one that appealed to me the way this one did. It’s called WinkinPaw – why – I don’t know. It’s located on the ‘wrong’ side of the road (ie: not on the beach side) – further south than us – on Moody Beach. Moody in that section is just beach. No tide pools, no rocks, no stones, no shells – and no lifeguard. Just miles of Maine sand in both directions. This makes it easy to walk and swim of course – but cuts down on the play and castle building opportunities that a more rocky – Maine-like – beach offers. On the other hand – it has real sand at the very top where the high tide doesn’t quite reach – soft and fluffy even. Nice. The house is a bit further from the entrance than our shack – and is clearly not a beach shack. There are 4 bedrooms (well – 3 bedrooms and a curtained off kids area) on the first floor – and upstairs is the living space. A huge open area of living, dining and giant kitchen. There’s a full bathroom on the first floor – and a 1/2 bath on the 2nd floor. There’s even a hot and cold shower outside for rinsing off beach sand – But this isn’t the reason for my envy. Nope – I’m about the view. And the view is amazing. There’s a porch that wraps around 3/4 of the house – so full front porch with views thru the houses in front to the ocean, a side porch, and a back porch with 180 degree views of the marsh. And the marsh is a wonderful sight. Full of birds, and kayakers, and waving cat tails and meandering water ways that curve and twist in a relentless search for the open ocean. I couldn’t believe the view. Stunning. I want that. Good think that the Pink Lady doesn’t care about views! She’s about how close are we to the beach – and in that regard – our shack wins. What does a palace cost? One that is not on the ocean? $3400 a week. Makes you wonder what 4 bedrooms ON THE BEACH might run, eh? Serious dent in pocketbook money I’m guessing. Oh well – better 2 weeks than one – but I’d still love that view…. What is a Maine holiday worth to you? For years my family and I have been going to Wells Beach, Maine for our annual lobster, chow’da, and ocean fix. I’ve come with my husband alone, I’ve come with my entire family (and there are a lot of us). I’ve come when my kids were small – I’ve come when my kids were grown and their kids were small. Right now I’m here with just one grand-daughter – Sophie. She’s 7 – and we’re totally into her time schedule. Wake and start the day when she does (which is around 9:30 am – but don’t tell her parents – I think I’m supposed to wake her earlier), eat, go to the beach, practice reading (I’m teaching her to read English), eat, go to the beach, practice reading, play dominos (she’s killer at that), and read stories and go to bed. Occasionally there’s a bath in there – and occasionally – like today – we have to break down and use the car to go get some food. Our needs – as you can imagine – are pretty simple. We’re walking distance from the Well’s Lobster Pound – which sells amazingly good clam chow’da. They have lobster too – but we just like to admire them swimming in the tanks. We’re really all about the chow’da. I happen to love sauting veggies in butter (yes – real butter – my ateries will survive) – so I have a tiny bit of chow’da and mostly veggies. Sophie loves the chow’da. So – chow’da and fruit and corn on the cob if we can find it are pretty much the staples of our diet – when we’re not on the beach of course. Last night we broke down and visited the Scoop Deck for ice cream. Huge portions – even the kiddie size is insane – and a zillion flavors. Of course I only get pistachio and Sohpie likes either Cotton Candy or maybe Bubble Gum. Which is better than it used to be when her flavor was color selected – PINK of course. We spent yesterday doing our favorite thing – exploring the tide pools near our shack. Us and about 50 other kids (ranging in age from 3 years to over 80) clambered over and on the rocks and into the pools. Sophie’s bucket contained a tiny lobster, 4 star fish, and a huge (at least hand sized) crab. There were also a selection of smaller objects – most of them still alive after being man-handled by probably 20 kids on their way into her bucket. The rule is – nothing that was ever alive goes to the house. You do have to be firm on this – rocks are ok – even dead lobsters are a no-no. Plan for today – replacing my dead aero bed, get food for dinner (we’ve cleaned out the house), and beach, beach, beach! Ok – so maybe a funeral is not in order – but I still have to figure out what to do with the dead body. I’ve enjoyed this aero bed for years – and now – in the midst of my annual Maine vacation – it decides to die. I woke up this morning sleeping on a balloon. No kidding. The maze of pathways that channel the air in the Aero Bed to keep it flat and bed like must have given way – and I was lying in the middle of a wall of puffed up bed-clothes. Extremely uncomfortable – let me tell you. At first I thought the bed had a slow leak, and my lying on hard surface meant I had to inflate it some more. So I stupidly did that – which just dramatically increased the balloon effect. Once I was awake enough to appreciate the horror of what lay beneath and beside me and above my head and below my feet – I managed to swim my way out of the bed and turned to survey the damage. It’s like a massive whale lying where my bed used to be. And guess what – you can’t get the air out either. It’s stuck in there. What am I going to do with the body…. What possess people to take a movie – even a hit movie – and transform it into a Musical? Imagine the conversation – “Well, we made millions on the movie – surely people will pay big bucks to see the same story with some dumb music added, right?” Aren’t they a bit embarrassed? Particularly if the ‘Musical’ flops? I’m guessing that the lure of more money is simply irresistable and drowns out the voice of common sense. Of course – I paid to see the both musicals. So what does that make me? Dumb and Dumber? But having promised honest reviews – here goes. The 2 ‘Musicals’ in question were Young Frankenstein – The ‘Musical’, and Shrek – The ‘Musical’. Both movies should be pretty familiar to all my readers – but if you don’t know the stories – or haven’t seen either lately – I suggest watching them again before reading further. They are both outstanding movies – fast paced and extremely funny. ‘Walk This Way’, ‘Roll in the Hay’, and ‘Put the Candle Back’ – even without the accents – always make me smile. And I can’t think of Donkey without getting a giggle started. So I was pretty up to see these performances. Young Frank was put on at the Ogunquit Playhouse, a professional summer theatre house in Maine that takes it’s self very seriously, even while doing musicals like ‘Guys and Dolls’ or ‘The Music Man’. They hire professional actors, the sets are well-built, the performers properly miked for sound, the hall is air-conditioned, and the price is high without being silly – it is ‘Summer Stock’ after all. Shrek on the other hand was produced by the Arundel Barn Playhouse – also ‘professional’, but on the – first job – level. The sets were simpler than those at the Ogunquit Playhouse, but still complex – the Dragon was a seriously top-notch piece of stage craft, but the performers weren’t miked, the theatre isn’t air-conditioned, and the seats appear to be recycled from a theatre in the 1930s – hard and a bit uncomfortable. But they weren’t afraid to charge – Tickets for adults were $40 each – pricy for basically university graduates. So for comfort, production values, and performer quality – the Ogunquit is the clear winner. Unfortunately – Young Frank is the decidedly poorer musical. What Mel Brooks did was to take the movie – leave in all the gags, including Frau Blucher – cue horses, and add very forgettable music. The highlight was easily ‘Putting on the Ritz’ – which they seriously expanded into a complete performance number which including having the Monster climb out of a cake. Another musical number, this one at least written for the musical and not too bad – was the rather adorable piece called ‘Join the Family Business’ which featured multiple doctors and nurses trying to convince Young Frankenstein to – well – join the family business. It ends with him crying ‘Destiny, Destiny’ of course. But all in all – the music is completely forgettable, you won’t remember a single tune after you leave, and there’s quite a bit of over-the-top sexually specific slapstick that I found frankly embarrassing. I didn’t poll my seat mates, but listening in to conversations as we left make me think that my family wasn’t alone in thinking that we’d been hood-winked into paying a lot of money to see a movie that we could get cheap on net flicks. Shrek – The Musical was very different. In this case – a lot of effort had gone into making the story more interesting through the use of the musical numbers. ‘I know it’s Today’ tells the history of Princess Fiona – growing up unloved in her castle tower, while ‘Freak Flag’ encourages Sherk to be proud of who and what he is. My personal favorite was ‘What’s Up Duloc?’, which starts with the song from the movie – and segways into a marvelous explanation of just how bad a ruler Lord Farquaad has turned out to be. Another charmer is the contest song between Sherk and Fiona – both determined that their lives have been the hardest – and summarized for the audience in ‘I think I Got You Beat’. And having Lord Farquaad placed by a very tall and thin young man on his knees, but wearing short ‘legs’ was a delightful visual treat. But Shrek, for all the lovely music, had issues too, mostly related to the production. By far the worst problem could have been solved by giving Shrek a mike. He was impossible to hear – and hard to understand if you could hear him. And we were in the third row. He was not alone in the ‘I can’t hear you’ department either. The gal that sang the Dragon had to stand at the back of the stage because of her ‘costume’ – and her voice seemed to go up into the fly – not out into the audience. Bummer that – from what we could hear, she had a fabulous set of pipes. Arundel Playhouse – invest in mikes for the performers. Please? So – two should have been good but weren’t – theatre performances. I’ll go back to the Oqunquit Playhouse next summer – hoping for a better pick of productions – but I’m not keen to try the Arundel Barn Playhouse again. Uncomfortable seats and inaudible performers just ruins even the best musical. Oh well – if you never go, you never know! My daughter did the 5k ‘Kennebunk Library’ Race – and when it finished, asked for Sushi for dinner. Oops – I know lots of restaurants in Southern Maine – but not one serves Sushi. What to do? Well – sometimes you just have to ask around. We spotted some ‘locals’ – and asked if they knew of a sushi place. They quickly suggested the Koi in Biddleford – and showed us the tripadvisor reviews – it’s #1 overall for that location. Sounded like it would do the job so we headed North. Biddleford is about 10 minutes from Kennebunk – and the Koi is right on highway 1. The building has clearly been repurposed – I’m guessing a bar perhaps. There’s a main room, and a side room. Nothing about the space, except the cleverly designed tables that fake a sit on the floor look but are really just standard tables, says Oriental – let alone Sushi. But there is one hard-working Sushi Chef in the corner – so I figure – why not. The menu covers the range from Chinese, thru Pad Thai, to Sushi. We focused on the Sushi selection – and it was pretty intense. There were standard offerings, but the Maki (rolls) which are my favorite option, were truly intriguing. I was particularly interested in the fresh fish options – I mean, we’re on the Maine coast, fish should be amazing. And it was. We tried the Amazing Roll – it was great. We also really enjoyed the UpTown Roll which mixed avocado with fresh salmon. The Sweet Potato Maki was another winner. Less impressive were the Eel Speciality, not bad, just not great enough to want to order again. To illustrate how impressed we were overall – when my husband arrived a few days later, we suggested going back – and had another delicious meal. 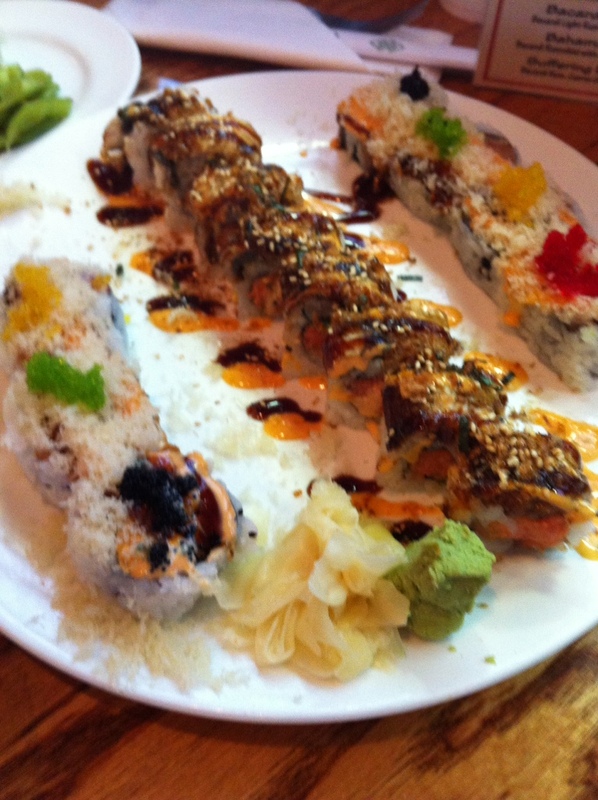 We repeated our orders from the first trip – and added the Iron Man Maki. Yum. We also tried the Tempura platter – but were less impressed. Bottom line – the winners are real winners, and I will definitely go back again. I adored the Amazing maki, the freshness of the fish was outstanding. Equally good – Sweet Potato Maki, Uptown and Iron Man. The Chef’s special that night – which included real Crab meat was also delicious. Less impressive (I’d suggest not getting these) were the Fantasy Eel and the Tempura Platter. We didn’t try any of the other ‘cuisines’ – so I can’t rate the Koi on those. B+ for sure – an A if they got a better Tempura Batter! We discovered the White Barn Inn several years ago. Located in Kennebunkport – known as the summer get-away spot for several US presidents – it’s not exactly the low-end option. In fact – the first time we went, they cautioned us that they had a dress code. My then 8-year-old granddaughter insisted that she’d definitely need a dress! For my husband, it meant borrowing one of their ‘loaner’ jackets. There are only 2 price points – you can choose the standard menu, at over $100 per person, or the 12 course Tasting Menu at over $150. Either way – you are definitely in for the taste thrill of a life-time. Yes – it’s that good. We’ve eaten at the White Barn once a year for the last 5 years. Generally we do the standard menu – but last night we did the tasting menu – just for the fun of it. And we were rewarded with some supremely yummy dishes and excellent service. Let’s talk service first. Upscale restaurants like The White Barn have several standard extras that just make the service that much more special. For example – if you get up to go to the bathroom – a waiter will quickly replace your napkin with a freshly folded one. Or when the entrees are served – at say a table for 6 – 6 waiters will arrive, one with each dish, and then at a discrete signal from the lead waiter, all dishes will be placed in front of the diners in unison. Makes for a lovely feeling. Other special service touches – fresh silverware for each course – regardless of which spoon or fork you used, salt service with both black sea salt and white sea salt, perhaps a butter tasting, bread options ranging from white to carraway seed – brought to the table in a large basket and individually served. One seriously nice touch – when we arrived, the wait staff lined up to greet us as we walked into the restaurant. My daughter, who has her chef’s papers from Culinary Institute of America, says that in a restaurant like this the staff is trained to say yes to any request. Then go back and make sure it was ok. But yes is the right answer at first. So refreshingly different from most restaurants where ‘no’ – or at best – ‘I’ll check’ seem the standard responses. But it’s about the food – right? With 12 courses – none very large of course – there are multiple chances for losers as well as winners. At the White Barn Inn, there were 7 winners – and last night – only 2 losers. The winners were the Carpaccio of salmon – incredibly thin slices of fresh salmon lightly seasoned and served with a sweet mustard sauce. Words can not describe how totally delectable this combination tasted on the tongue. Another winner – the Morel dusted Beef Tenderloin. Perfectly seasoned, delightfully raw, super tender, melt-in-your mouth delicious. And my third favorite – the chocolate pre-dessert with its candied pistachios and tiny piece of chocolate cake and airy chocolate pudding. I also liked the duck dish, the pork belly, and the foie gras duo. The Sherry vinegar ice cream with fig roll was a savory/sweet surprise. Less wonderful overall was the butter poached smoked lobster – in my case the smoke didn’t happen and my piece of lobster was slightly over-cooked. Neither of us was thrilled with our main desserts. The souffle was very ‘egg white’ heavy, not rich and dense like a proper souffle. And the doughnuts, which looked lovely, were heavy-handed and dense. I guess I was expecting ‘beignets’ – not clunkers. Oh well. Fortunately, the Friandise served with the bill made up for the ‘oops’ on dessert – I loved the dark chocolate ‘stick’ and the raspberry jellies. Bottom line – if you’ve got the money to spend, and a special occasion to celebrate, or just really need an outrageous night out – the White Barn is perfect. Just call ahead for reservations and don’t be surprised if the only option is a 6:00 seating. Merriland Farm Cafe – so good, we went back 2 days later! Now that’s good. Breakfast is always a bit tricky as a ‘eating out’ meal. We all know that its fast, easy, and relatively inexpensive to just make your own coffee, cereal, maybe a bit of fruit, some yogurt. So why eat out. It’s just going to be expensive. I must at this point admit that I find the proliferation of coffee shops (here – and in Korea) a bit puzzling. As noted – making coffee at home isn’t that hard. And for $100 you can get a foamer that works perfectly every time – so its not about the latte. I think it must be related to convenience. Run it – drop a few bucks – get coffee. Tis a puzzlement. But moving on to ‘eating out’. A serious breakfast place has to offer something special I think. It’s not good enough to just have 5 different kinds of omelets – discriminating guests demand extras. And on that score – the Merriland Farm delivers – in spades. First location. It’s not really that well located. Its off the main drag (on the beach in Maine – that’s Route 1). And not towards the ocean either. It’s up in the hills – right before you are on the wrong side of 95. So as far as location goes – it has it’s work cut out for itself. To make up for that – it’s on a berry farm – fresh blueberries and raspberries. And it’s on a 9 hole golf course. So the surroundings – while not ocean – are rather spectacular. You can choose to eat out side, or inside. The main building dates from 1800 – but it’s been modernized and sophisticated. Hardwood floors, beamed ceilings, great paint job. It’s very nice. The A/C is a bit on the weak side – and the rooms can get a bit warm – but they are lovely. And not so noisy that you can’t hear yourself think. The breakfast menu is long, detailed, and mouth-watering. The ‘tea bread’ starter is outstanding, too bad it’s not free. Order it – and you get a fresh loaf of blueberry laced bread with a delicious crumble on top. Yum. There are omelets, a selection of ‘Benedicts’ – including a lobster Benedict. There are waffles served with their farm made blueberry/raspberry mixture that are the best I’ve ever had. All the various dishes are served with your choice of sides – sweet potato fries (oh yum), or the absolute best thing – a 3 potato medley. Purple, Sweet, and Plain potatoes roasted to potato perfection. On the table – Maine maple syrup – as if things aren’t sweet enough. The savory options include heart stopping options like Sausages and Pancakes. Even the Bacon is sweet – but delicious. The one ‘oh well’ for us was the corn beef hash – my husband still thinks that the one he makes at home is better – but otherwise – outstanding. How outstanding? We went back again for breakfast just 2 days later! It’s an A. Oh, yes – definitely an A.
I’m not totally sure why I so frequently get disappointed at restaurants in Ogunquit. Ok – I’m not keen on restaurants that charge over $300 for 7 people – that’s a lot of money for dinner with 2 kids. And I’m even less of a fan of restaurants that work to evoke fame – pictured of the Chef with Gorden Ramsey on Hell’s Kitchen – cool or Kitch? But I do know that Angelina’s isn’t the first restaurant in Ogunquit to seriously disappoint me. Although from the crowds – I’m guessing I’m alone out there. We were 7 – and ordered 4 different appetizers, and 6 main courses. We even ordered 2 desserts. So you can’t say we didn’t try a fair sampling. Of the 12 offerings – only one – the Eggplant tower, was impressive. And it was great. The eggplant was lightly fried to perfection, the cheese fresh and definitely yummy. Very good. The salmon was also good – but hardly a Maine tradition. I guess my main complaint was really the Lasagna that I ordered to share with Sophie. At Varenos – we’d shared a Lasagna large enough to have half left to take home for lunch. For more money, we got about 1/2 the Lasagna at Angelinos. It was yummy – but still. 1/2 the size, more money – not thrilling. Truly disappointing was the steak we ordered. It was easily the most tasteless piece of meat I’ve ever had. My grand-daughter the ‘steak-aholic’ couldn’t even finish the tiny piece they gave her. More risotto then steak – but given how tasteless the steak was – I guess the portion was acceptable. Dessert – one winner, one loser. The winner was the carrot cake. Rich and creamy – quite yummy. But the loser was a commercial frozen lemon sorbet. Hey – if you are expensive, and ‘chef owned and operated’ – don’t opt for a commercial frozen dessert. We do know what they look like. And it made me wonder about the carrot cake. Was that also commercial. Anyway – bottom line – a C. Too much money for the quality of food we got served. But I will give them points for a very pleasant restaurant, and the service was quite acceptable. Easily the best Lobstah in all of Maine – Trust me! Nope – I’m not joking. I know the best place to get Lobstah – and Clam Chowder in Maine. And I’ll even share that information – but only after you get the entire picture. My idea of the perfect holiday day starts with coffee, cereal, fresh fruit, and a sea breeze. The sound and sight of the ocean never ceases to bemuse and relax me – even when it’s cold and rainy – or hot and sunny – it’s not ‘Maine’ that I love – it’s the ocean. The fact that going to Maine makes it easier to get to the ocean is of course critical for vacation planning purposes – but without the ocean, Maine would just be another state. So – breakfast listening to the ocean, a day spent with my feet in the sand, maybe jumping the occasional wave if the water is anything other than frigid – lunch of left-overs or fruit, and then dinner. Ah, dinner. Maine doesn’t lack for restaurants – from the fab to the touristy, from the fried fish to mock italian, even Chinese and Thai. You want it – you can get it in Maine. But what I want is Lobstah and Clam Chowder. We have rented what can best be described as a shack near the beach for at least the last 15 years. It’s small, it’s cozy, it’s across from a great walking and surfboarding beach – and it has a kitchen. Because there’s a kitchen, we can eat in. And that brings me right around to that best lobstah in Maine claim. It’s the Wells Beach Lobstah Pound. The offerings are stunningly simple. Lobstah – you can get it raw – but for free they will cook it for you – and trust me, they know how to cook Lobstah. You just choose your size – tiny little ones, the 1.5 lb ‘normal’ size, up to 3 and 4 lbs monsters if you order ahead. They toss your choice into the cooker – and 15 minutes later – hand you a bag to ‘take-home’. Butter costs 60 cents extra – but you don’t need more than one to be honest. The Clam Chowder comes in pints and quarts – we always get a quart – and rarely have any left for the next day. Oh yes – they also sell fresh off the boat fish – the quantity of which depends on the luck of the fishermen that day – generally there’s haddock and scallops for sure. And they will do the work for you and just give you the lobster meat – an option that I really don’t understand. If you don’t want to mess with the Lobstah – don’t eat it! Can you do better? Maybe. I’m sure other people have their favorite pounds – but for me – this is the best. Lobstah is best eaten within the sound and the smell of the ocean, and the Wells Beach Lobster Pound is perfect. Just perfect.